MADE IN THE USA: Cayman Kitchen Butcher's twine is produced in Tennessee from 100% Cotton that is grown in the USA. Our twine is food safe and is designed for cooking with no additives, preservatives, or unwanted chemicals making it a safe choice for your family. PROFESSIONAL CHEF GRADE: This sturdy 16 ply cotton twine is the same type that professional chefs utilize. It is perfect for trussing turkeys, preparing meat for the bbq grill or smoker, tying herb bouquets, preparing roasts, rotisserie cooking, stuffing chicken breasts, and so much more. Ideal for your Holiday Roast or Thanksgiving Turkey!! 1200 FT: Cayman Kitchen 1 lb ball of twine contains approximately 1200 ft of cotton twine. It is ideal for craft projects, tying packages, and bundling newspapers or recycling. Cooking string is one of the most versatile kitchen tools. OVEN SAFE: Durable and strong, Cayman Kitchen Twine is ideal for cooking. It is oven safe and works great on the rotisserie, smoker or grill as well. 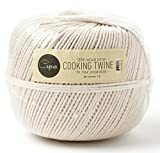 BIODEGRADABLE: Cayman Kitchen Twine is an un-bleached, natural and biodegradable option for everyday use, crafting, or special occasions like a Christmas feast! Cayman Kitchen Butcher's twine is the healthy choice for all of your culinary adventures. Made in the USA from 100% un-bleached natural Cotton, this 16 ply twine is ultra-sturdy and durable. Cooking twine has literally hundreds of uses in the kitchen and all around the house. Preparing meats and roasts, trussing turkey, stuffing chicken breast and tying herb sachets for recipes are just a few of the uses of this versatile kitchen tool. Twine comes in handy for so many household uses.